This article outlines how to reset your password for your Plesk account through your ExactHosting portal which can be accessed here https://www.exacthosting.com/whmcs/clientarea.php. If you do not have the credentials to login to your ExactHosting portal please refer to this article Reset-your-ExactHosting-Portal-Password. 1) Login to the ExactHosting Portal and enter your credentials. 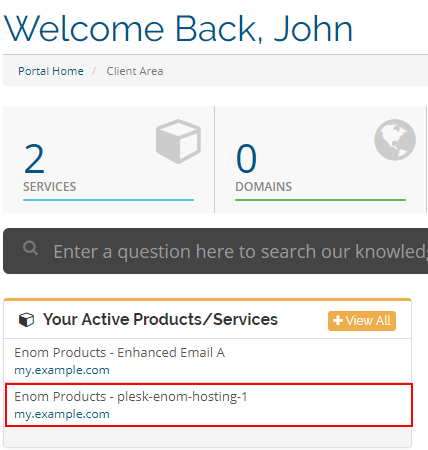 2) Once logged in navigate to the "Your Active Products/Services" panel and click on the option that contains "plesk-enom-hosting" as the product. Note: You will click on the grey area surrounding said product and not your domain name as that will redirect you to your website. 3) On the "Manage Product" page simply navigate to the "Actions" panel on the left hand side of the page and select the "Change Password" option. 4) On the "Change Password" page simply provide a "New Password" making sure that the password strength bar turns green to confirm that your password meets our servers requirements. Once you have decided on your new password simply enter said password in the "Confirm New Password" box as well and push the "Save Changes" button once complete.